Solid Dimensions Inc is a USA manufacturer of environmentally friendly wood products for the promotional products industry. Since our inception in 1994, we have been designing, manufacturing and decorating innovative, unique and high quality products. 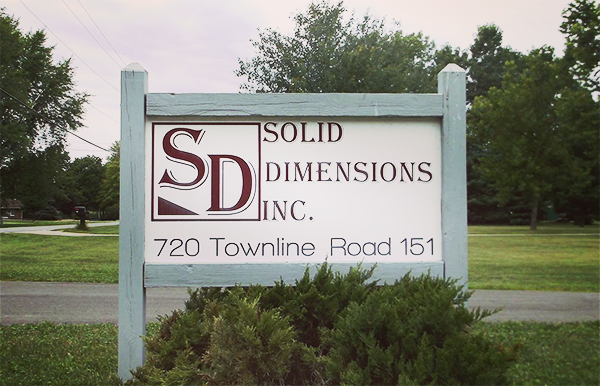 Our products are presented to the market as the Solid Dimensions Line. Nothing speaks louder than the feedback provided from our customers. We are proud of our top scores in each of the supplier performance ratings as well as our A+ rating with the Better Business Bureau. The lumber we purchase is harvested from professionally managed forests using widely accepted Sustainable Forest Management (SFM) standards. We utilize the latest in eco-friendly stains, finishes and other materials used in our manufacturing process. We specialize in custom products using various wood species, both domestic and exotic. Materials such as leather, metal, glass and acrylic are also used to enhance or widen our product mix and design. The Solid Dimensions Line of wood products is made with state of the art, technically-advanced woodworking equipment to give you the quality, features and reliability you need. Whether you sell a product from our standard collection, or a custom designed item, we are here to help and support you. We offer in-house computer-aided design (CAD), computer-aided manufacturing (CAM), integrated product manufacturing, JIT inventory management, cutting-edge computerized graphical design, high resolution optical scanning laser engraving, Computer Numerical Controlled (CNC) cutting lasers and routers, high resolution direct to substrate 7 ink 4-color digital printer and of course, an environmentally friendly finish and attractive gift box. Our items are unique and offer a blend of natural materials, offering the best traditions of American woodworking with progressive innovation. We are a quality focused and dependable supplier offering you a strong line of proven products at affordable prices. Show the Solid Dimensions Line with confidence and let us help you look good. If you don't see an item in our Line that you would like made, just ask. We strive to be your supplier of choice for wood and natural material products.